Definition at line 30 of file CMassAction.h. Definition at line 38 of file CMassAction.cpp. Definition at line 43 of file CMassAction.cpp. Definition at line 48 of file CMassAction.cpp. References CONSTRUCTOR_TRACE, CCopasiMessage::ERROR, Infix, MCMassAction, setInfix(), TriFalse, and TriTrue. 50 CFunction((reversible == TriTrue) ? Definition at line 67 of file CMassAction.cpp. Definition at line 69 of file CMassAction.cpp. 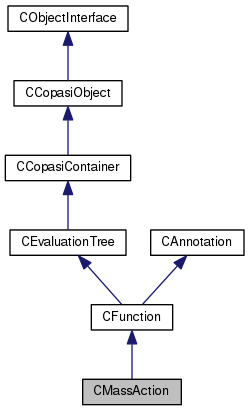 References CCallParameters< Type >::begin(), C_FLOAT64, CCallParameters< Type >::end(), CFunction::isReversible(), CEvaluationTree::mValue, and TriFalse. 81 * *(Factor++)->value; // first substrate. 98 * *(Factor++)->value; // first product. Definition at line 164 of file CMassAction.cpp. Definition at line 107 of file CMassAction.cpp. 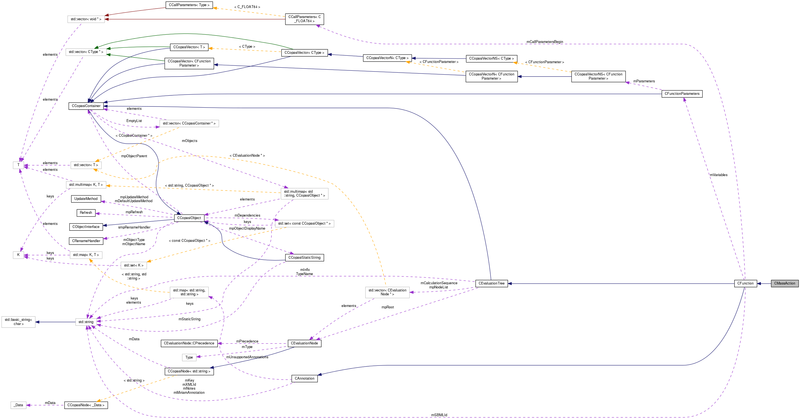 References CCallParameters< Type >::begin(), CCallParameters< Type >::end(), CFunction::isReversible(), and TriTrue. Set the infix description of the tree and compile it. Definition at line 132 of file CMassAction.cpp. References CFunctionParameters::add(), CFunctionParameters::cleanup(), CFunctionParameter::FLOAT64, CFunction::getVariables(), CFunction::isReversible(), CFunctionParameter::PARAMETER, CFunctionParameter::PRODUCT, CFunction::setInfix(), CFunction::setReversible(), CFunctionParameter::SUBSTRATE, TriFalse, TriTrue, and CFunctionParameter::VFLOAT64. Function to write the mathematical formula in format of MathML. Definition at line 173 of file CMassAction.cpp. Definition at line 34 of file CMassAction.h. Referenced by CMassAction(), CQValidatorFunction::validate(), and CQExpressionWidget::writeMathML().